With the popularity of adult coloring books on the rise, Jasmine Becket-Griffith's Halloween: A Coloring Book couldn't come at a better time. 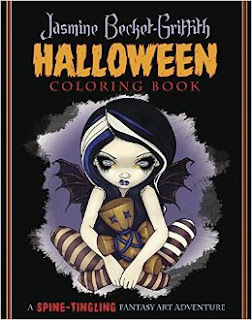 I personally have always had a coloring book handy around the holidays, especially at Halloween and Christmas. It's one of my favorite holiday traditions. The coloring book features 55 original black and white pieces drawn by Becket-Griffith that covers traditional Halloween monsters and frights along with illustrations connected to other cultures. On the left side, Becket-Griffith provides information regarding her pieces, including how the original was created and when it was created. She also gives personal notes for each of the coloring pages, connecting to her art and her personal life. On the right side, Becket-Griffith provides full page, black and white illustrations that range from encompassing large spaces to fill in or more intricate patterns. Each coloring page begs to be marked on from children to adults! Honestly, the pages are so beautiful that I really don't want to color them (but I can't resist! ).